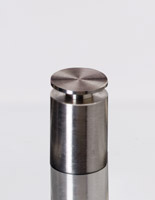 0.5625" x 0.5625" 0.75" x 1"
Fixture can be used outside becuase of its rust-resistent, stainless steel construction..
Darker gray finish can add elegance to any environment in which they are used. 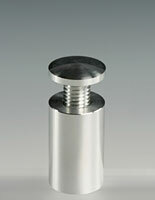 The tamperproof standoffs use a set screw to secure the system to a wall. All of the necessary installation hardware is included iwth purchase. No buying extra pieces! These sign fixing systems are perfect for business owners that have been looking for a tamper-proof standoff. 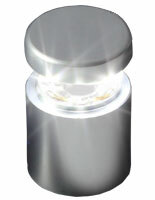 The display mounts featured here have an innovative way to ensure that panels are safe from harm. 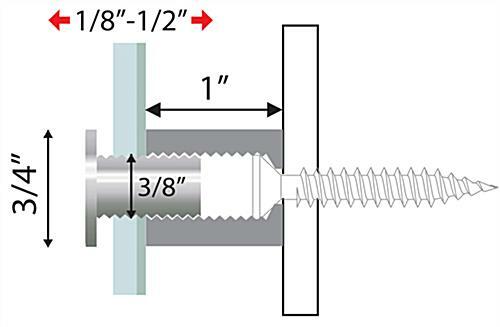 These sign fixing systems, also known as round spacers, have set screws that are able to secure the mounted display where it is hung. 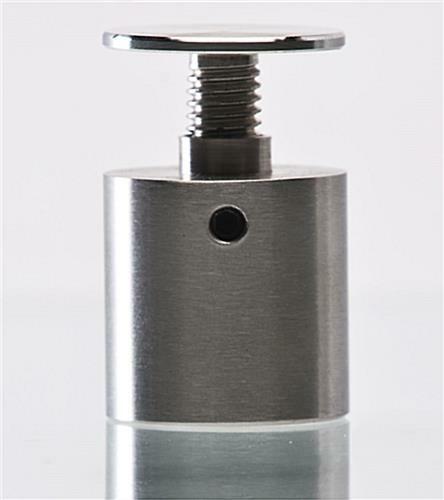 Most standoffs have caps that just screw into the barrel of the base and tighten onto the signage. Sign fixing systems of that style are targets for vandals and thieves. 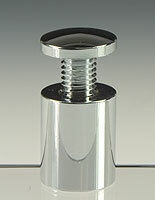 The set screw that is manufactured into these tamperproof fixtures is the solution to unsecured signage. The sign fixing systems are needed whenever displays will be mounted in high traffic areas, such as universities, bus stations, office building and commercial environments. 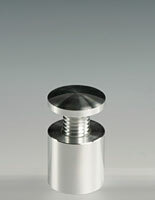 These fasteners are more fashionable and affordable then other display mounts that are set for purchase online. 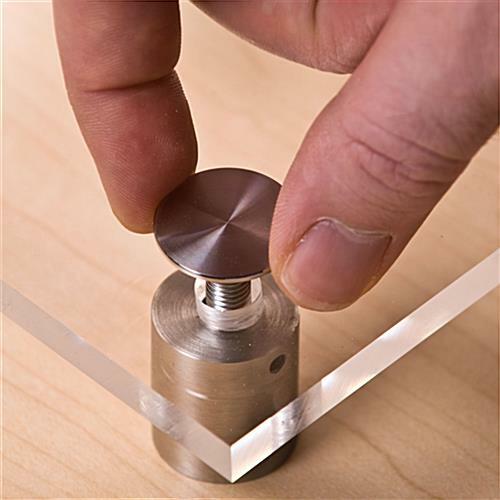 The sign fixing systems that are secure are manufactured from stainless steel, which makes them weatherproof. 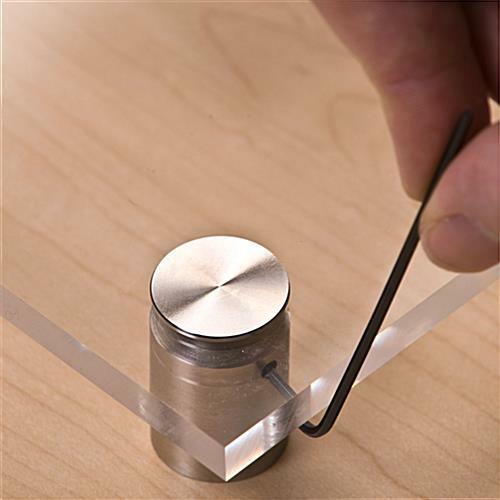 This construction means they are resistent to rust and more durable than softer metals, like aluminum. The sign fixing systems include everything that is needed to hang these mounts to a wall. 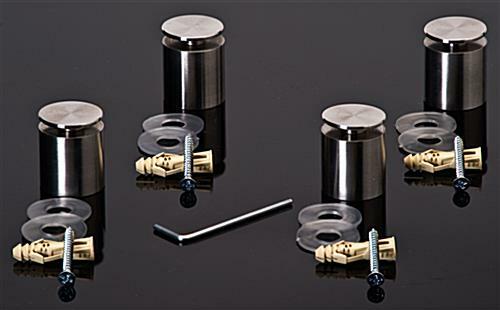 These standoffs that are available in sets of (4) units per order also come with screws, plastic washers, anchors, and an Allen wrench for manipulating the set screw. The sign fixing systems include standoffs with a diameter of 9/16" so these fixtures can work for accentuating larger displays. 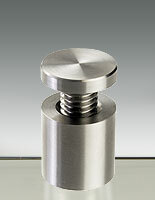 The standoff hardware is a more stylish choice than just simply hanging signage with standard screws. 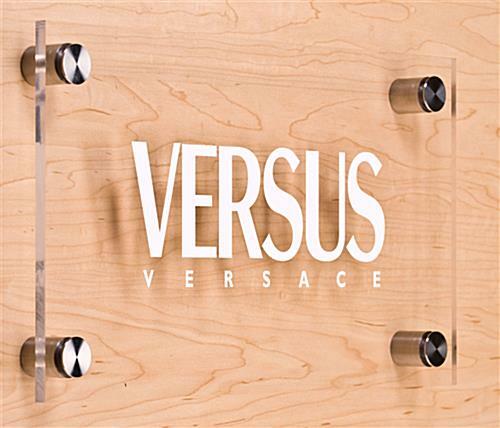 The sign fixing systems truly add class to any environment in which they are placed. 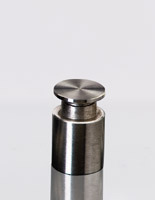 Not only is this round hardware economical, fashionable, and tamperproof, but it also qualifies for same-day shipping when ordered by 1pm EST, Monday through Friday, and the item is available for purchase. 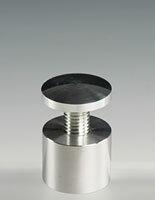 Please Note: Signs will need 3/8" diameter holes drilled when mounted with this standoff hardware.